Compared to the other light hikers in this test, the Arc’teryx Acrux performed exceptionally well for rugged hikes that involve a lot of scrambling and creek crossings. 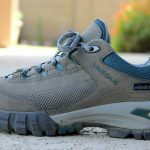 The shoes may seem overkill for those looking for a basic light hiker for day hikes, hiking with the dog, or just trail walking. Compared to the other light hikers in this test, the Arc’teryx Acrux, (called the Alpha at its launch at last summer’s Outdoor Retailer trade show), performed exceptionally well for rugged hikes that involve a lot of scrambling and creek crossings. This is a serious piece of gear, and is in fact the first technical footwear on the market with a removable and interchangeable liner, like a ski boot. The first two shoes in the Arc’teryx line, the Acrux (non-removable liner) and Bora lightweight hikers, will feature this two-piece construction: tongueless inner liner and seamless hydrophobic outer shell. 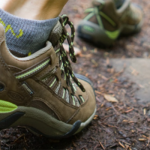 This is not just another iteration of a traditional hiking shoe. In all there will be eight styles for men and women, separated into low-cut approach shoes (Acrux FL) and mid-cut hiking and light trekking boots (Bora Mid), and the company took four years in their development. The Arc’teryx Acrux are nothing if not stable. Even without the widest outsole and low cut upper, they feel bomber underfoot due to their construction, the inner liner and unique outsole. The Vibram sole wraps from heel to toe similar to a mountaineering boot, and the main lugs are circular, not the typical triangular shape. The cord laces are engineered almost down to the toe to get a snug fit around the liner and foot, adding to the stability. The Acrux proved extremely protective from front to back, top to bottom. I was climbing moves up to 5.6 in these shoes, jamming my feet into rocks and cracks, kicking off rocks, jumping and running the trails and scrambles, without a worry in the world. The upper features stitch-less, thermoformed and laminated TPU and other space-age materials. I’ve never felt more protected in a light trail shoe. The materials and technology were developed in-house at Arc’teryx and some of the construction methods are so new the company had to make custom production machinery to manufacture the shoes (see Construction). I wouldn’t call the Acrux the most comfortable shoe in the bunch, or on the market, but it’s not uncomfortable if you like a tight fit. It’s built for performance with comfort in mind rather than specifically for comfort. The inner liner hugs the foot and the included Ortholite insoles are quite comfortable, but it takes a little getting used to, as does the swing weight. The construction of Acrux —as well as the rest of the Arc’Teryx footwear line—proved very durable in my testing. Arc’teryx took all of its experience with laminations and thermoforming to create a seamless one piece upper laminated with four layers of hydrophobic materials. Those four layers include: a non-woven DWR-treated microfiber for smooth internal surface; a textile woven with PU coated Nylon yarn for air flow and abrasion resistance; a 0.2 mm TPU film to build integral upper support; and a 0.35 mm high abrasion TPU film reinforcement on more exposed areas. A breathable, woven PU-coated nylon yarn insert area allows for air exchange. The laminated upper covers the free-moving EVA midsole, connecting down to the Vibram rubber sole, solidifying protection and durability.